"Pinterest Junkie" like I am? Pinterest site with the recipe to make these. This was so much fun, I just had to share! I felt like a kid again, making these Christmas ornaments. years ago, to make sugar cookies with my mom. For me, I like the simple white with natural twine. If you want color, you could try painting them! I crocheted with my favorite linen yarn. 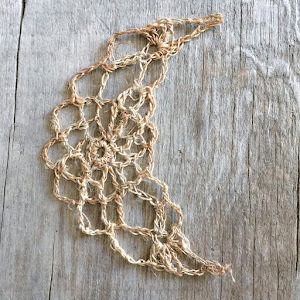 "This is not your grandma's doily"
will make pretty gift tags too. Let me know if you make some...I'd love to see your style! Those ornaments are so pretty. and so is your crochet doily.. I love the color you used. those are gorgeous Becca! Such a pretty design...they could be everyday ornaments too! I love them, and even more so because of the star cutter, and the embossing. Next I want to use my snowflake cookie cutter, I think those would be fun. Such a pretty craft Becca! And I love your Christmas photos below - lovely! And Lucy is adorable of course! Very pretty, Becca! How'd you get the design on the clay? That makes an ordinary star beautiful! What a great project, I think clay ornaments may be in my future too! Thanks for sharing. I rarely get excited about ornaments but I LOVE your stars! Love them!! And how neat you are using the same cookie cutter. That's it – you've inspired me to get everything done I need to so I can play with some fun projects like this. Becca, your stars are absolutely beautiful. I simply love them!!! I'll definitely make them - they look so gorgeous! I love the simplicity of the things you create Becca - thought-ful, and beautiful, and always, always, inspiring.